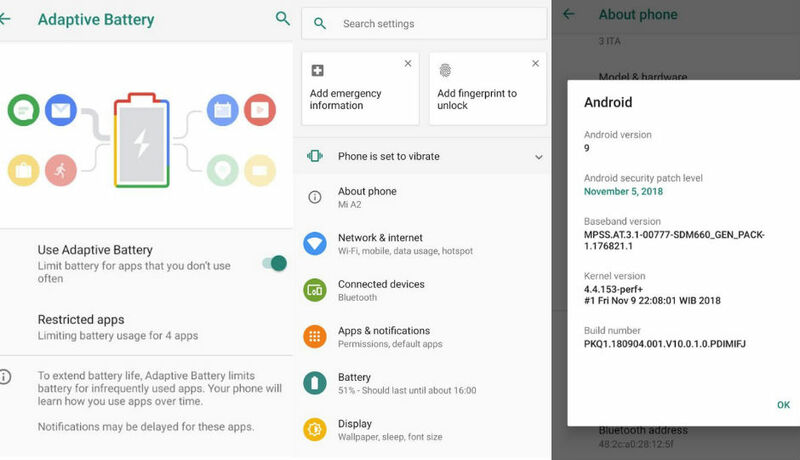 Mi A2 Android Pie Beta Leaked. Xiaomi Launched the Mi A2 smartphone in August this year and it is the second offering from the chinese company that comes under google's Android One Programme. This means that the Mi Xiaomi A2 will get at least two OS updates and the first update in the line is the Android pie update. According to XDA Developers, the update is nearing release as the first beta update hs been spotted online. The beta version has featured Such as Adaptive Battery, as well as renewed filled-in navigation buttons,with navigation gestures also available as an Alternative. The News comes a few weeks after Xiaomi Mi A1 - Company's first phone under Google's Android one pragramme - was spotted on Geekbench running Android Pie 9.0 given the reports and leaks, the Xiaomi Mi A2 could be become company's third phone after Mi Mix 2s and Mi A1 to receive the latest android OS update. XDA Developers says that the ROM is official, but since it's a beta release, it could be filled with bugs. Users are advised to wait for an official rollout and those who don't want to install the beta updates can wait further for a stable release. Also, if you are one of Xiaomi's smartphone users, You may also want to check out this list to see whether your phone will get the Android Pie Update or Not. Xiaomi launched the Mi A2 in four colours in india - gold, lake blue and black and rose gold. The phone sports a 5.9-inch Full HD+ display with an aspect ratio of 18:9, and it is protected by a corning gorilla glass 5. The Mi A2 is powered bu an octa-core qualcomm snapdragon 660 chipset clocked at 2.2GHz. As Mentioned above, since the phone has launched under Google's Android One Programme, Customers will get unlimited high-quality photo storage on google cloud, as well as monthly security updates and at least two major OS software updates. There is a fingerprint sensor and a vertically stacked dual-camera setup on the back. The Dual-camera system on the Mi A2 featured a primary 12MP sony IMX486 sensor having 1.25 micron pixels and a secondary 20MP sony IMX376 sensor for portrait photography. Both The lences have f/1.75 aperture. There is a 20MP front camera with a sony IMX376 sencor and Xiaomi's super pixel technology. The front shooter features Al-powered symantec segmentation for an enhanced bokeh effect and HDR for better quality photos.